Did you know I like Yoko from Gurren Lagann? Well I do! I own about 28 Yoko figures and am still missing only one to complete my collection of all the Scaled PVCs of Yoko. This is the latest one that has been released for Gurren Lagann’s 5th Year Anniversary. Of course I’m partially biased when it comes to figures of Yoko, so it’s hard for me not to like one. Still for the price I feel the quality of this Yoko figure is pretty awesome. It isn’t up to par with say GSC or Alter but she’s still very nice for a prize figure. Boota is grabbing onto Yoko’s top and pulling, seems she’s worried her top might fly off at any moment! Some seam lines as well as the paint is a bit too glossy for my taste. As well as there are some shading issue with this figure, however she wasn’t much money and you do get what you pay for in terms of quality. Her face is pretty adorable with the open mouth, but if you don’t look at her at the correct angle she does look a little derpy sadly. The base is simple but the way she’s being held up is cool. 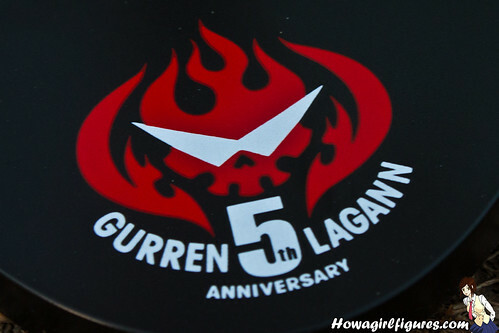 The 5th Anniversary, makes me wish more companies released Gurren Lagann merchandise for this 5th year. Nice view from the back, her shorts are very devoid of any detail, not there there is much to focus on. As mentioned her base is pretty awesome in that it has Lagann’s hand coming out to hold her up. It really does add that extra special something nice to this figure. Top view of the Oppai! This Yoko isn’t the best out there for sure, but if you’re on a budget I’d say she’s the one to get. If you’re looking for best quality there are plenty of other Yoko’s out there that are much better and prettier. I got her as I’m a huge fan of Yoko and Gurren Lagann and couldn’t resist! If you’re like me or are just looking for an inexpensive Yoko figure, then I’d get her!! Get your own at anyone of these fine retailers! AX Live! Every Thursday at 7pm PST! We’ve been doing Giveaways recently so make sure to check out the show to be able to win some awesome prizes!! Plus every week we give away a 4day badge to the convention!! Btw… why your Yoko’s skin is that shiny?, mine doesn’t looks like that :O? I like it! I try to limit the amount of figures I have of one character due to space but sometimes I break my own rules! So far I have 3 Yokos, 3 Sabers I think. Its been discussed on MFC, but it appears there is some leaning issue with her. The lean is apparently around her waist area rather than the ankle/leg area. One user posted a pic in which they used a trading figure peg, attached to the inside wall of a detolf and rest Yoko’s arm against it. Here’s what one MFC user is doing. I try to find something similar before I display her. Nice review and the figure looks quite good considering it’s prize category. Does she have a metal screw in her leg that would keep her from leaning? just yesterday were 2 preowned for around 1100 JPY @ amiami … sold out already. its nice but not for my taste.